Day 9: Stand By Me – The San Francisco Bay Trail: It's Closer Than You Think! How long does it take a speeding train to come to a complete stop? I pondered this question throughout my hike this morning after crossing train tracks half a dozen times during the first few hours of my trek from Rodeo to Point Pinole. Truthfully, the question first rose to the top of my consciousness as I looked down at my map from the southern tip of Pinole Bayfront Park and back up to my next trail-head, Pinole Shores Regional Park. Then down at the map again and then up. What stood in my way was about a quarter mile, perhaps less, of heavily used railroad tracks. That and the fact that I had no idea what I would do when I got to where I thought I needed to be. Would there be a fence, a cliff to scale, would an Amtrak fly around the corner and make the whole question moot? By the way, the answer is about one and a half miles at fifty miles per hour. Fortunately my pre-frontal cortex has developed beyond the capacity of a sixteen year old and I decided that: (a) I can no longer run a sub sixty second 400M, (b) I don’t want to go to jail, (c) Being ping-ponged between an Amtrak and freight train is not how I want to leave this world. I looked back down at my map, turned around and made my way back up Tennent Avenue to historic Pinole before turning south on San Pablo for Pinole Shores. 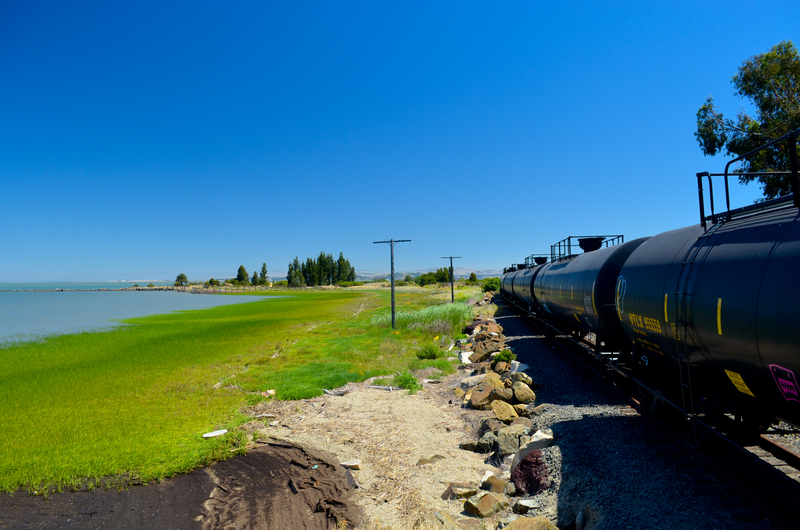 Railroads are a big part of the history in this region and that is more evident than ever when traveling along the Bay Trail. Pinole, my new favorite Bay Area small town, has a wonderful mural on Tennent Avenue under the railroad overpass dedicated to 100 years of railroad history in these parts. I fell in love with this city immediately and could have hung out here all day. Old brick buildings still stand proud and masculine among a town dominated by both small, classic Victorians and a mansion just outside the gates of Pinole Bayfront Park, once occupied by former mayor and town matriarch, the Honorable Gretchen Willcomb Mariotti. As I left old town I stopped for an apple and chickensicle (barbeque chicken breast in a ziplock bag – yum!). This was a decision I would regret a few minutes later as I passed by a Fosters Freeze with a full stomach. After a brief pause, I hesitantly kept moving toward my next destination. I had a schedule to keep. When I got to Pinole Bayfront Park I forced myself north rather than south so I could see if the 400M dash would have been possible. No, it would not. Steep hillsides, fences, and fast trains. Seriously, they just kept coming: Amtrak, freight trains, service cars…DON’T DO IT, NOT WORTH IT. Sorry, I am not lecturing you as much as I am repeating what I said to myself a half dozen times today. After arriving at the Point Pinole trail-head fairly spent, I talked to a very pleasant woman at the front gate who informed me that a shuttle would be back for its last trip (2:30pm) to the point in ten minutes. I dug out the one dollar needed for a round trip fare, took a seat on a bench and drank my last few ounces of water as I waited. The shuttle driver was a very cool guy of thirty years give or take who was born and raised in Pinole and I regret not getting his name and shooting a few frames of him. The tats on his arms reflected a cool edge and he spoke passionately about his hometown and job with the East Bay Regional Park District. The western tip of Point Pinole was well worth the extra effort after a long thirteen miles on my feet. I looked north, west and south and could see all 107 miles of my journey thus far laid out along the shores before me. The pier was still active with fishermen and a couple of hikers were still roaming the hills and shores. This is an amazingly peaceful and under-used place. Virtually no crowds in the mid-afternoon hours on a warm and breezy Saturday! The trip home was a welcome rest after the miles I had put away between Rodeo and Point Pinole. After a short wait of about ten minutes in front of the West County Detention Facility adjacent to the park, I boarded the Alameda-Contra Costa 71, swiped my Clipper card and sat back as we weaved our way through several Richmond neighborhoods before pulling up to the Richmond BART station. After a very long day, I tuned out by tuning in to my iPod. My playlist, with the likes of Vedder, Zeppelin and Jack White made a great soundtrack for the BART ride home as I reflected on the day, although Ben E. King’s “Stand By Me” would have worked as well after today.